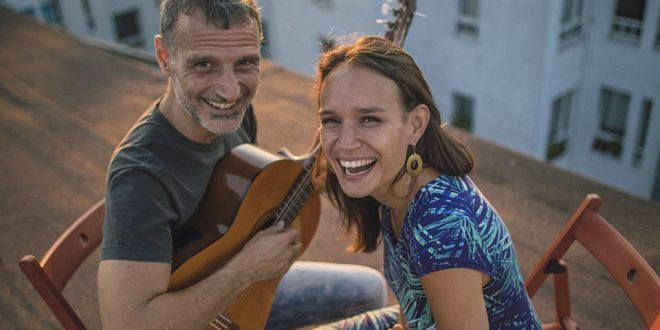 The duo of BETO CALETTI and MISHKA ADAMS has its musical roots firmly planted in South America’s Afro-Latin rhythmic traditions. Their sound stretches from the African influenced Baião of northeastern Brazil, south through the jazzy harmonies of samba and bossa nova from Rio, down into the earthy beats of Uruguayan candombe and the dancing rhythms of the chacarera and milonga of Argentina. Their compositions emerge from this melting pot of rhythms, and take the listener on a journey in four diverse languages – Spanish, Portuguese, English, and Tagalog (Filipino) – Mishka’s mother tongue. The combination of guitar, handheld percussion and intricate vocal harmonies bring an intimate experience of story and song, tradition and innovation, and love across continents.